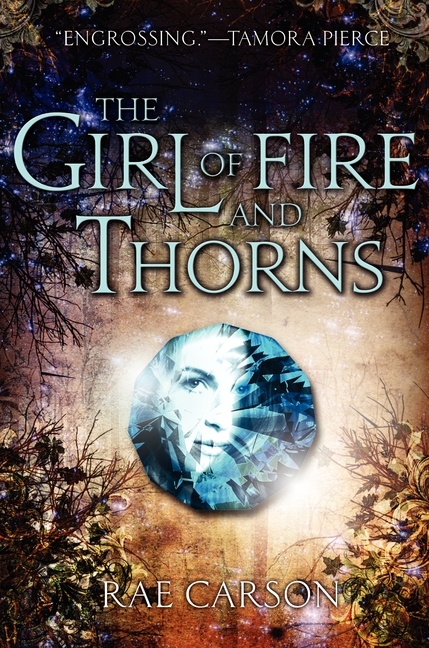 The Girl of Fire and Thorns is a wonderful story of a girl learning to be strong in her own way. Elisa is a heroine who doesn’t swing a sword or shoot a bow; instead she fights to overcome her self doubt so as to become the leader she needs to be. She travels just as far internally as she does physically, and I adored how this story showcased a kind of strength that didn’t stem from muscle and sinew. As much as any warrior heroine, Elisa fights for what she believes in – but this book is more of an origin story, as Elisa discovers a cause worth fighting for and learns she’s capable of taking on the fight. Elisa’s battlefield is a mire of politics and intrigue, and she faces it armed only with her wits. It’s wonderful to watch her shed the shackles of her self doubt and slowly come to believe in her own worth, and it makes for a lovely coming of age story. Now, yes, Elisa’s insecurities are tied in to her physical appearance – she starts out this story very overweight (and I have to say it made for a very refreshing change of pace from the standard skinny and fit fantasy heroine) – and I can understand why some people will grumble about this book being a somewhat standard fat-girl-gets-thin-and-suddenly-is-happy-and-attractive story. But while that arc, generally speaking, is most definitely present in this book, to call it such is to miss the entire point of Elisa’s story. From the very beginning, Elisa’s eating is a symptom, not the cause of her unhappiness – Carson drums it in that Elisa is an emotional eater, and that food is her coping mechanism for dealing with her struggle with self doubt. I found it exceedingly realistic and sympathetic that someone raised with such towering expectations – royalty, and a religious figure to boot – would need such a coping mechanism, and that food would be it. It’s hard enough being a teenage girl – and I think anyone who has ever been a teen will relate to Elisa’s lack of self confidence – but for Elisa, who has such greatness expected of her, it all is magnified to the extreme. But that’s not to say that Elisa’s weight issues aren’t hard for her – as a public figure, she definitely has to face a series of humiliations as a result of being overweight. Seeing how she handled them made me like her enormously, and seeing how they hurt her made her wonderfully real. As for Elisa’s weight loss, it happens naturally in the face of hardship, and frankly I didn’t bump on it at all, because as anyone who has ever done backpacking or serious hiking can tell you, you burn some drastic calories with that kind of physical effort. I think there will probably also be some muttering about how fast and convenient her weight loss was, but I thought the physical hardships were realistic, and most importantly, it wasn’t just about burning calories. Elisa’s sojourn isn’t just difficult for her physically – she has to rise to the challenges she faces emotionally and mentally as well, and it all forces her to address the root of her self-doubt. The journey isn’t about Elisa loosing weight, it’s about her path towards believing in her own worth. As for the romance, it was established from the beginning of her travels, and so I had no problem with it at all – the seeds were planted before the weight loss took place, and there was a definite personality basis to it, as it’s really the first time Elisa is treated as a real person, instead of a person of importance. All in all, I thought it was very sweet. So while in the end, yes, Elisa definitely gets a confidence boost from loosing weight, the moral of this book is far from thin-and-win. This story is about Elisa learning to trust in her will and intelligence, and finally coming to believe she is worthy of the responsibility and higher calling placed upon her. To call this a weight loss story is to do this story a grave disservice. As for the fantastical side of this book, Carson has a deft touch when it comes to world building – her fantasy world feels fresh and exciting, and I had a real sense of discovery as I was reading. With lovely texture in terms of politics, religion, magic and languages, this book is rich and, as Tamora Pierce’s cover blurb promises, engrossing. I’ll admit I did have to pause when I first read of the jewel embedded in Elisa’s navel – it was a bit, well, overt – but I got over it quickly and I very much liked how the religious aspects of this story were present without being overwhelming or overly familiar. All in all a very impressive debut. Really my only real cause to grumble about this book is on the plot side. I absolutely loved the internal side of this story, and the relationships and emotional repercussions are all wonderful, but in terms of pure plot mechanics, the action and the problem solving, I could have done with a bit more depth and complexity. I liked the shape of how Carson was moving her pieces around the board, but a few things felt a bit forced, and the ending was a tad convenient for my liking. Still, it leaves me with high hopes for continuing plot developments in the next book. For a series’ start, and a debut author, The Girl of Fire and Thorns makes for an impressive beginning. Elisa is a sensational heroine, striving to fulfill her potential under perilous circumstances, while realistically growing in resourcefulness, inner strength, and intelligence. The odd nature of the Godstone (which is embedded in Elisa’s stomach) may occasionally pull some readers out of the story, but Carson’s mature writing style, thoughtful storytelling, appealing characters, and surprising twists add up to a page-turner with broad appeal. …it’s wonderfully refreshing to see a heroine using her brain to win a war rather than strapping on a sword and charging into battle. Despite the stale fat-to-curvy pattern, compelling world building with a Southern European, pseudo-Christian feel, reminiscent of Naomi Kritzer’s Fires of the Faithful (2002), keeps this entry fresh. My deeper concern centers on Elisa’s weight. The character lets you know right off that bat that she’s fat. Quite obese, judging by the descriptions. She’s an emotional overeater who uses food to compensate for feelings of inadequacy. From the beginning, we know Elisa is bothered by her weight, doesn’t like public functions because of her shyness and doesn’t think her new husband will have any interest in her when he has a thin mistress by his side. And he doesn’t. No interest in her body, at least. Since it’s a political pairing, I can understand that reasoning. My concern, however, is that Elisa’s growth into a strong woman, capable of leadership, is directly paralleled by her weight loss. A weight loss that is caused by a kidnapping, a desert trek and starvation. As she’s rapidly/unhealthily dropping pounds, she’s becoming more confident, more athletic and, finally, finding romance. I worry the story reinforces the idea that thinness, beauty, romance and intelligence are irrevocably intertwined…Despite these misgivings, I enjoyed this novel for its rich setting and fluid pacing. Still, the fact that these details of motivation and choice bother me shows that Elisa is a person and not a paper doll. I was particularly impressed that Carson motivates and explains the choices she makes for Elisa’s starting point – she’s not anxious, timid and awkward just ’cause, for character development convenience. I was completely sold on Elisa’s anxiety as an intelligent girl having to live her whole life with nebulous and inexplicable massive expectation over her head; she desperately wants to succeed as a chosen one, but has no idea how to succeed, there is no one to tell her, with the constant possibility that she could be failing at that moment without knowing it. Her sensitivity to the disappointment of others and to the awkwardness of her body were spot-on. Her ignorance is again, not just for plot convenience, but for religious cultural reasons and because there simply is no road map as to how she is supposed to do God’s will. Carson’s secondary characters are a mixed bag; some characters are simply and lightly sketched, but others show promise that Carson can hint at characters’ backstories and complexities even when there is little time devoted to them. Carson’s worldbuilding and plot also suggest that she will be an author with much more to say. The religious landscape, where different cultures have different interpretations of the will of God, has overt but not obnoxious references to the real world’s religions. It’s a refreshing change from the usual bipolar fantasy options – Greek pantheon-esqe polytheism or club-you-over-the-head Christian. She touches on competing currents in the nobles’ world (nobles from the highborn to their bastards, competing theologies, soldiers, servants, spies, and children) lightly but as deftly as is usually only seen in dense wars-and-thrones fare. Carson definitely left me wanting to know more about the cultures that populate her world, and I’m looking forward to seeing the intrigues deepen as Elisa continues to mature.